A certificate of authenticity for the sale of a horse signed by John Brown. Brown claims the horse was taken near Fort Scott, Kansas Territory, during the Kansas/Missouri border conflicts in 1858 and that this was his riding horse during his activities in Kansas, Missouri, Nebraska, and Iowa. 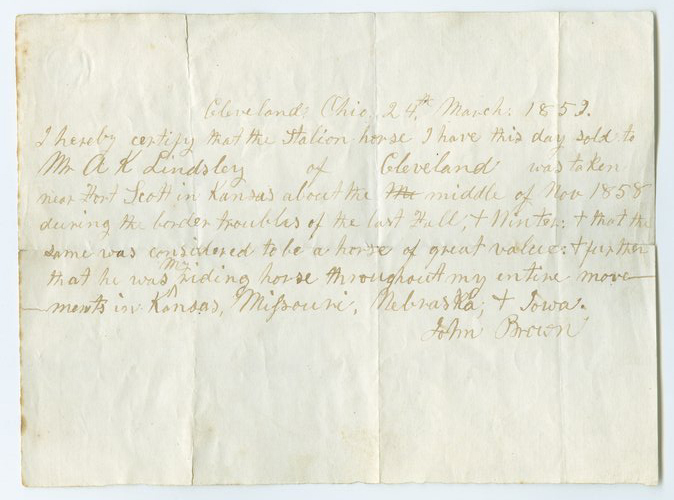 The transaction was executed in Cleveland, Ohio, between Brown and a Mr. A. K. Lindsley.